Handbook conforms to the easy-to-use format and style established by Faye Brown, now written by Nelly Leon-Chisen, RHIA. Learn to code ICD-10-CM and ICD-10-PCS, or sharpen your knowledge. Learn to Code ICD-10-CM and ICD-10-PCS in the same format created by Faye Brown. This edition does not contain answers to exercises or quizzes. 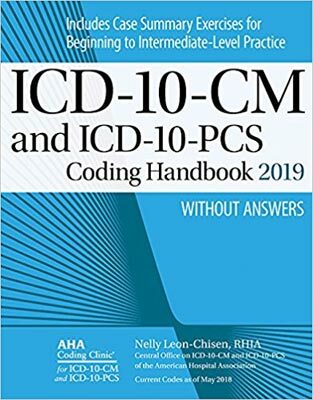 Handbook content reflects revisions of the Official Guidelines for Coding and Reporting as well as AHA Coding Clinic® for ICD-10-CM and ICD-10-PCS content published through May 2018. More than 50 four-color illustrations of anatomy and common disorders and procedures make it easier for readers to remember and absorb complex information. The 2019 edition features new artwork to clarify spinal fusion surgeries and aneurysm procedures.